The Houston Country Club in Houston is as famous for its membership as it is for its golf course. It has hosted its share of prestigious tournaments over the year, and members include former U.S President George H.W. Bush, Secretary of State James Baker, and other prominent Texas dignitaries, politicians, and corporate leaders. As the club’s profile increased, it became obvious that it needed increased parking facilities to accommodate major events and tournaments. 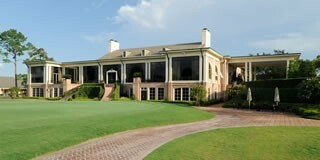 In 2011 Houston architect Jackson & Ryan was selected to design an underground garage to accommodate about 400 vehicles and allow direct access to the clubhouse and social venues of the Club. The task was complicated because the garage would “planted” across one of the golf course fairways, and it would have to be constructed without causing too much disruption to the course or the surrounding upscale neighborhoods. The use of the area above the garage would be converted to the driving range upon completion. The garage was designed to be approximately 170,000 sq ft. plus tunnel areas. Pepper Lawson Construction, L.P. of Houston was selected as the general contractor for this $10.5 million project. Their work began in May of 2012 with the excavation of approximately 85,000 cubic yards of soil. Although the removal of this huge quantity of soil is a task in itself, finding a place to put this much material could have been a major issue. Fortunately, the architectural firm, Pepper Lawson, and club ownership arranged to use the soil in other areas of the golf course for various hole restoration and reconstruction projects that were also planned. Essentially the soil was dug up on one side of the course to be reused to reinforce golf holes near the bayou. 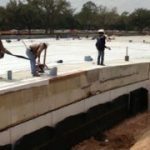 The project was competitively bid with Western Waterproofing Company of America in Houston being awarded as the successful waterproofing contractor. Their task was to successfully waterproof the top, bottom and all sides of this underground garage. 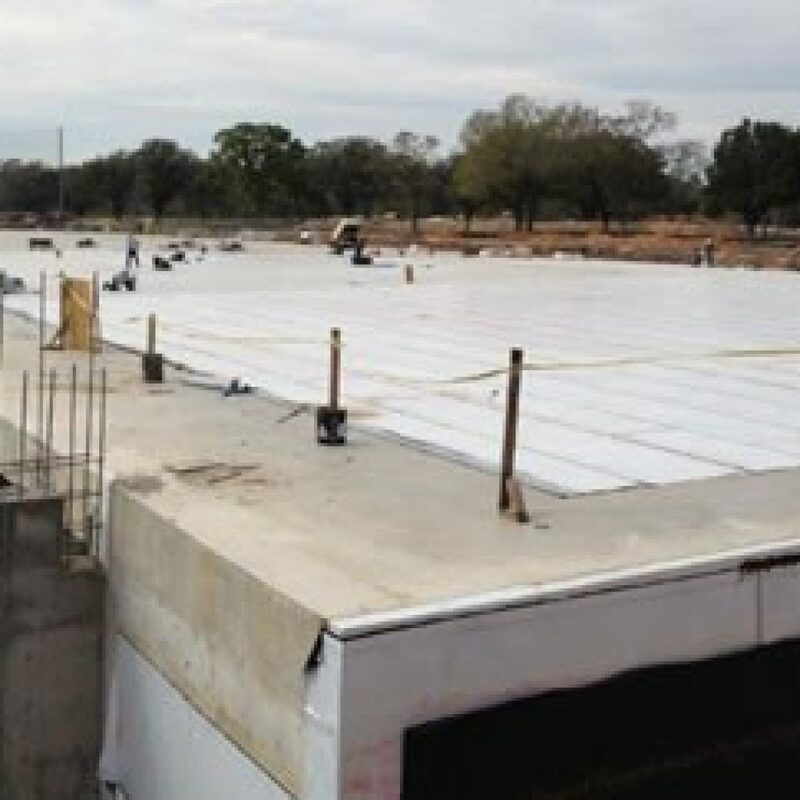 Price Consulting, Inc. of Houston was selected to provide the waterproofing specifications and details, and to support the general contractor and waterproofing contractor with regular inspection services throughout the construction phase of the project. 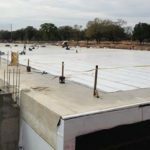 The project used Polyguard’s Underslab Membrane beneath the entire slab area, and the self-adhering Polyguard 650 Membrane for the vertical walls and the lid of the garage. In addition, Polyguard provided the horizontal protection course and the drainage composite for the entire structure with Poly Flow 15P and 18H drainage products to convey the water away from the structure. Perhaps the key feature that caused Polyguard to be the system of choice was their pre-formed column boots that drastically reduced the detailing labor around the 200-plus interior columns of the garage. These boots also allowed the movement capability that was desirable by the architect and consultant around the columns if there was any vertical slab movement. 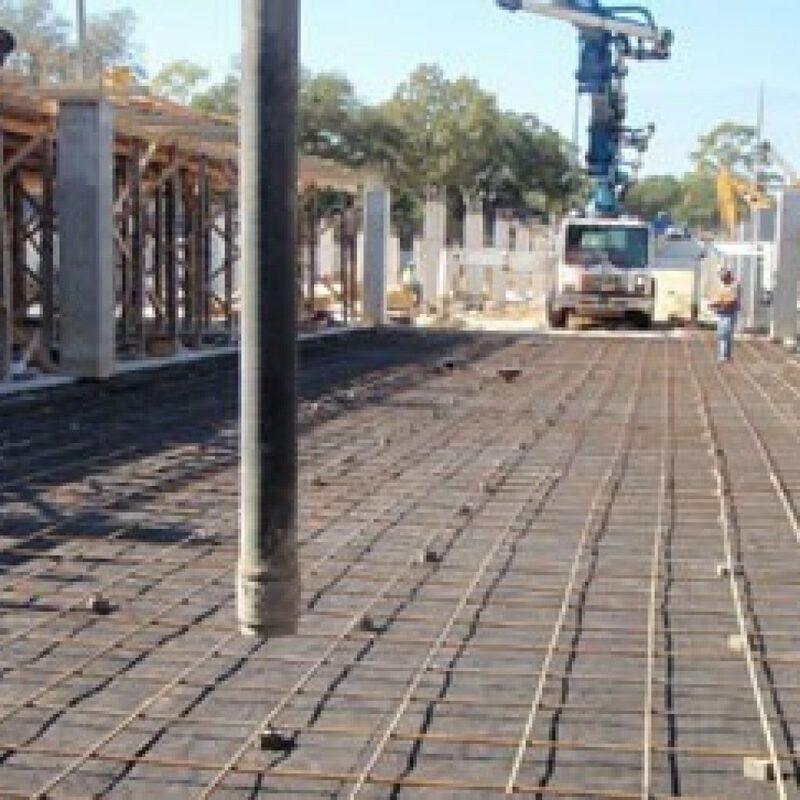 Polyguard representatives worked closely with Price throughout the pre-bid and construction phase of the project to ensure proper quality control and adjustment during waterproofing application. The excavation began in early summer of 2012 and progressed sequentially across the jobsite. Piles were drilled and the grade was leveled in sections. Next, contractors installed and compacted the drainage stone. Finally, Polyguard Underslab a 73 mil thick, self-adhering membrane was placed and lapped together. All lap areas were rolled with a minimum 75 lb. roller. Column areas were waterproofed with the pre-formed column boots which Western Waterproofing claimed saved approximately 45 minutes per column of detailing. With the waterproofing in place, workers placed steel reinforcement set on plastic foot chairs. Concrete for the floor slab was to be poured concurrently with the wall areas, so before the concrete could be placed, edges needed to be detailed. On the interior face and around each column, edge detailing was accomplished with double-sided detail tape, reinforced with mechanically attached termination bars and Detail Sealant. The exterior wall areas were waterproofed after the concrete was placed with the Polyguard 650 Membrane System and Poly Flow 15 P drainage composite. The post-tensioned garage lid was the last concrete to be poured and was sloped to allow water runoff around the perimeter. It was waterproofed with Polyguard’s 650 Membrane System and 1/4” Asphaltic Hardboard. In addition, Western Waterproofing installed Poly Flow 18H drainage composite to the perimeter vertical walls. Integral to the construction of the garage were various tunnels connecting the parking area to the clubhouse and other social venues at the club. 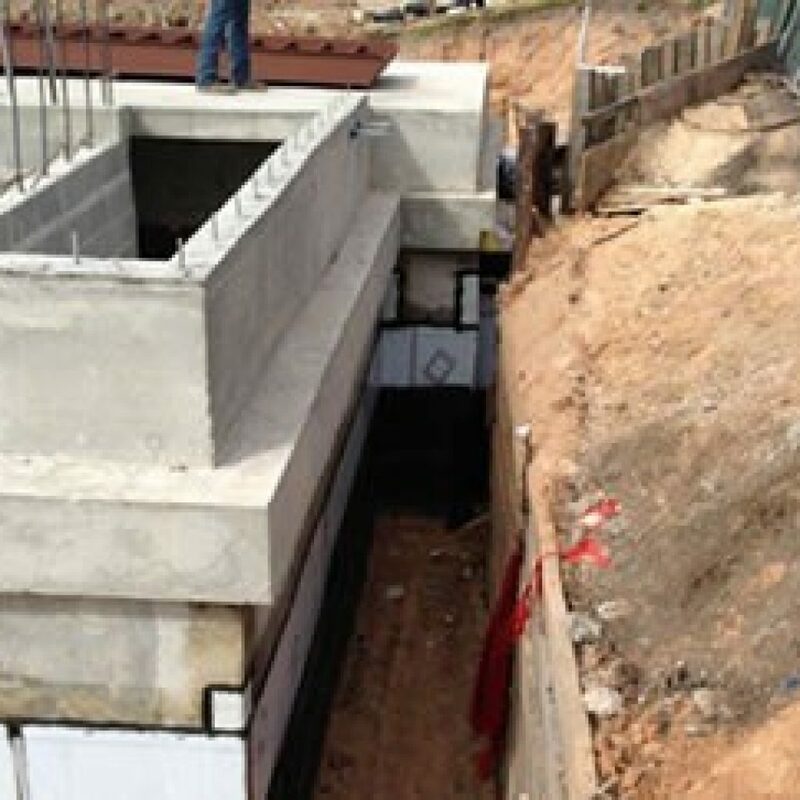 These areas were surrounded with Polyguard waterproofing in the same fashion as the garage box with the addition of expansion joint systems from Situra, Inc. that successfully connected the garage to the tunnel and the tunnel to the elevator room for the clubhouse. These expansion joint systems were compatible with the Polyguard Waterproofing Systems used and helped to complete the envelope of protection required. Prior to backfill operations the garage was water tested using the technique of field vector mapping to insure that there was a “hole in none” which is certainly appropriate for a golf course.